Consumers Credit Union is proud to announce that we have been honored with the Credit Union Excellence in Business Lending Award from the CUNA Lending Councils. “I was thrilled to accept this award on behalf of my team. What we have accomplished over the past couple of years doesn’t happen without our entire team being engaged to serve our members. Our Business Development Managers are second to none and I feel strongly that is the key to our success,” said Vice President of Business Services Gary Ferguson. The Council also noted that our marketing department was instrumental in the success by promoting awareness through billboards, television ads, blog and social media posts, and member testimonials. We are thankful for all our business members—without these partnerships this achievement would not have been possible. Additionally, we know this award comes from a commitment by all Consumers employees to help every member achieve their goals and live their dreams. Ferguson accepted the award on behalf of Consumers at the CUNA Lending Council’s Annual Conference in late October. 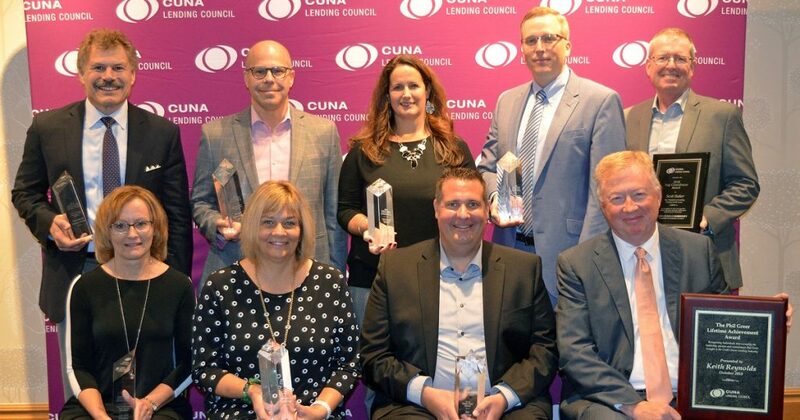 Pictured: Vice President of Business Services Gary Ferguson (top left) receives the Credit Union Excellence in Business Lending Award from the CUNA Lending Councils.